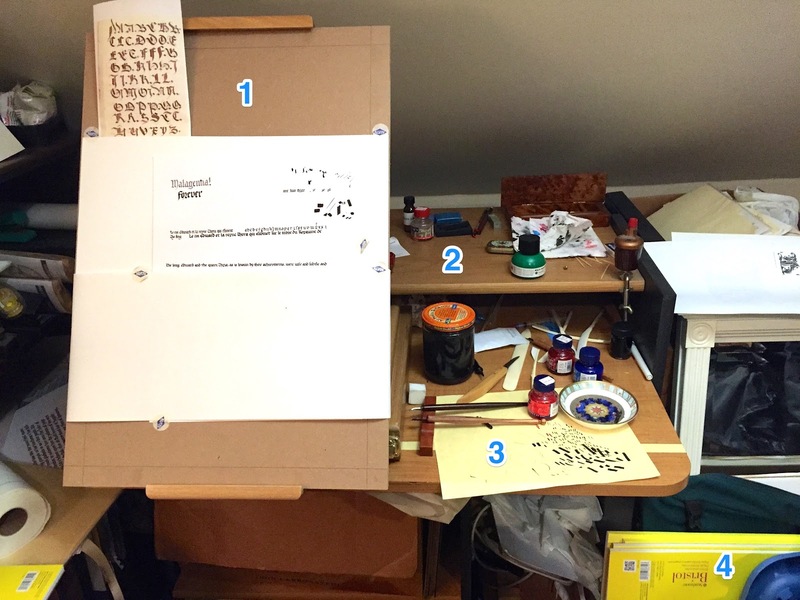 Prompted by a series of posts on the SCA Scribes Facebook Group, I wanted to share some pictures and discussion of my scribal workspace at home. 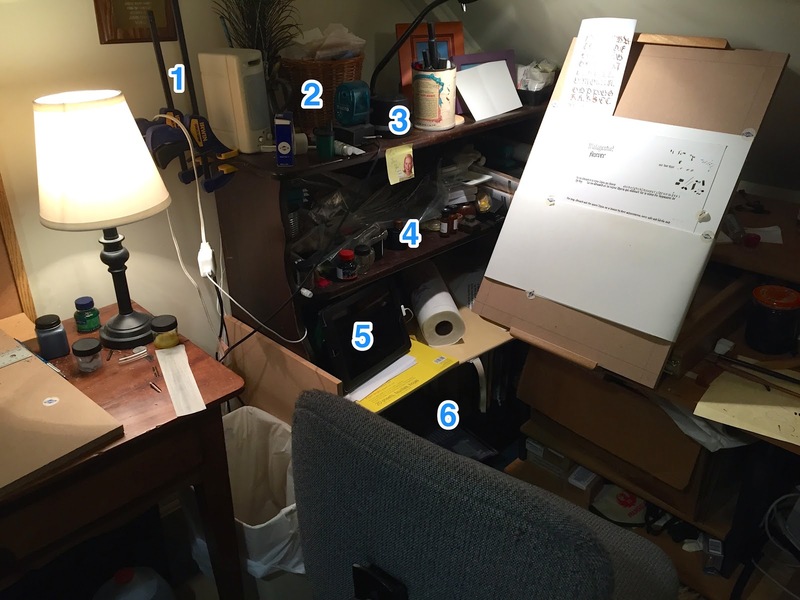 The request was to post your workspace "as is", and not to pretty it up for the camera. All I've done is make sure that there are no secrets shown that shouldn't be. My scribal workspace is in the corner of our guest bedroom / craft room. It's in a quiet corner of the house with a bathroom a few steps away allowing for quick and easy cleanup. It lacks natural light, so I make do with lamps instead. A couple printouts I used as inspiration for my last project. They are from "A model book for scribes" by Gregorius Bock, ca. 1510-1517. Barely visible under these pages is my antique portable writing box, a gift to me from my mother when I first started getting into scribal art. I keep quills, nibs & nib holders, erasers, an extra AMES guide, inks and other small tools in this box. It often accompanies me to events so I try to keep it stocked with tools I or another scribe might need for emergency calligraphy at an event. Rulers, T-square, AMES guide. These often live on this desk as it is where I do most of my pencil lining. On top of a small MDF drafting board are a few of my cleanup tools: a dry erase bag, a Mars eraser, and a brush for removing eraser particles. Never, ever user your hand to wipe away eraser bits! Oils from your skin can do bad things to your artwork, or create huge problems applying additional ink or paint. Blowing is also dangerous, as unintended saliva can cause bad things to happen to your completed artwork. A 2mm drafting pencil sits next to some bottles of ink I was using for test writing (Higgins Eternal and Winsor & Newton Green, in case you want to know). The clear jar holds a small cloth bag that contains a mix of dental pumice and gum sandarac "pounce" for page preparation. A couple of nibs sit next to a strip of "polishing paper", a very fine sandpaper that I use for nib & quill sharpening. Bar Clamps. How are these a scribal tool? I used one clamp to hold my phone and the second to anchor the first clamp to the shelves when I took the videos for the AMES Guide article. A box of drafting dots, pencil sharpeners, and a couple tubes of gouache paint. My halogen desk lamp. I've had this thing for all of my adult life. I would love additional lighting options, but this one works well, so I haven't needed to upgrade yet. To the right of this lamp, behind the picture frames are some bags of the floral sand I used for heat-curing quills. The middle shelf contains my iPad, sitting on top of my pads of paper. I use it to play music in the background. Further in the back is a pile of my practice sheets from previous projects, as well as handouts from classes at events I've been to. The bottom shelf of doom! The bottom shelf is a little deeper, so contains a few sheets of larger paper, as well as bags of sheet protectors I use when transporting the scrolls. This is where I do most of my writing. Occasionally I'll practice or work on my preparation desk, but almost all of my finished calligraphy is written here. I've said it dozens of times and I'll say it again: if you haven't tried working on a writing slope, you really should. There are several reasons why medieval scribes did and professional modern calligraphers do. Another page from Gregarious Bock's Model Book. I like to keep reference pages up at the top of the slope so they are in my field of view. This is also where I tend to keep printouts of the words I'm writing. Keeping these things at the top of the slope is both period and a good idea. A sheet of bristol used as backing paper to provide a bit of cushioning. I plan to redo this so I have a stack 2-3 sheets of paper. My hope is that the extra cushioning will help me to write with a softer touch. A practice page is tucked between this cushioning paper and the blotter paper. The blotter is a piece of cheap poster board folded over with the fold on top, wrapped around the writing slop and taped to the back. Ideally, this sheet should be wrapped tight enough that it holds the paper you are working on in place. You can then slide the paper up and down to keep it an an ideal working height, while your hand rests on the blotter so you don't transfer any oils. My blotter sheet has loosened up, and I need to fix that. I'm thinking of taking a piece of hemp cord and tying it around to provide pressure. Right now, if I'm not careful, the piece Im working on can slide down, which could cause ink to smear if it hasn't dried. This top shelf of the desk contains inks, nibs and other supplies I may need during the project but am not using right at the moment. I sometimes clean this are up and rest my computer here if I have a reference I want to look out but haven't printed out. I have a clamped drafting pencil sharpener here, which is *much* easier to use than the portable version. 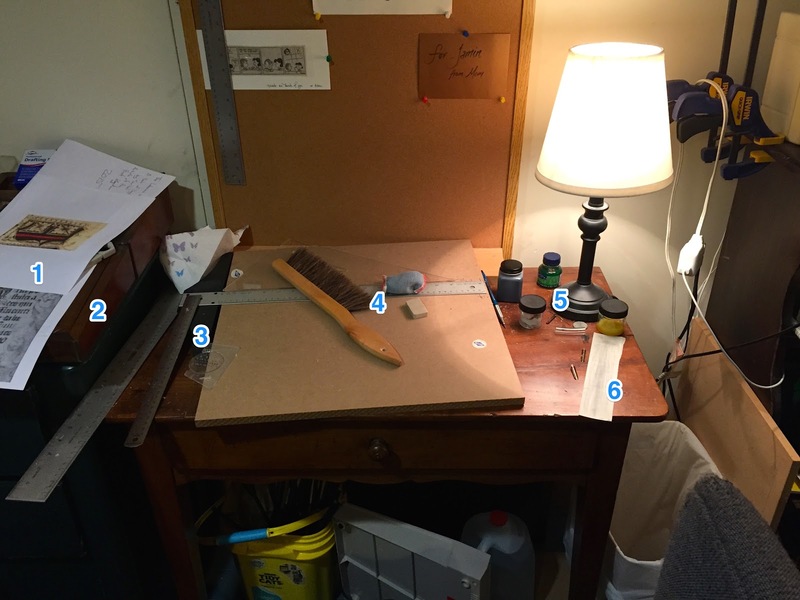 The desk surface to the right of my writing slope is where all my active tools and materials live. The orange-topped jar of black liquid isn't ink, but water I use for quick nib cleanings or thinning of ink. I keep it covered when not in use so my cat doesn't knock it over or drink from it. To the right of the water jar is an envelope of nibs, my quill knife, a bone folder, quills, and some inks. The colorful dish is where I place my open bottle of ink when working. It helps collect the dried ink particles that rain down whenever I open the bottle. It should also at least help contain a spill should I knock the bottle over. Under the dish is a piece of cheap paper I use to test ink flow after dipping my pen. To the left is a pen rest with two pens on it. I sometimes work on a piece with a couple of colors or sizes, or switch from a wide to pointed nib in the process of working. This lets me switch back and forth quickly and keep ink from getting all over everything with the pen rolling around. When I'm working, I will also keep a folded paper towel in this area for quick nib cleaning and in case of spillage or to absorb ink on any small mistakes I make. It's much easier to scrape a mistake off if it has less ink. Extra large paper doesn't fit on the shelves, and for the moment, is stacked here leaning on a table. I really need to find a better place for it. If I had the money and space, here are the changes I would make. Better artificial lighting - I'd like a clamp light or two that are more easily positionable, both on the prep/cleanup area and to the left of the writing slope. Maybe one with a magnifier? I enjoy working small, and my eyes are starting to hint that I ought to maybe help them out a bit when I'm doing that. Larger writing slope/table - A larger writing slope or drafting table would make certainly make things easier. A drafting table with a built in parallel ruler could make the lining process go faster as well. I definitely don't have the space for this at the moment. Paper & Supply Storage - Again, if I had the space, I would like a set of paper storage drawers to the right of my writing slope for storing both paper and inks / supplies. If it were the correct height, I could use it for the currently in-use inks and pens, freeing up the writing table to be 100% slope. It could also open the bookshelf up for storing books!